Answer: If you’re a regular reader of this column, you probably have at least a basic curiosity about the night sky, telescopes, and matters astronomical. If you’ve ever wanted to learn even more, and experience astronomy on a personal basis, that opportunity has at last arrived. 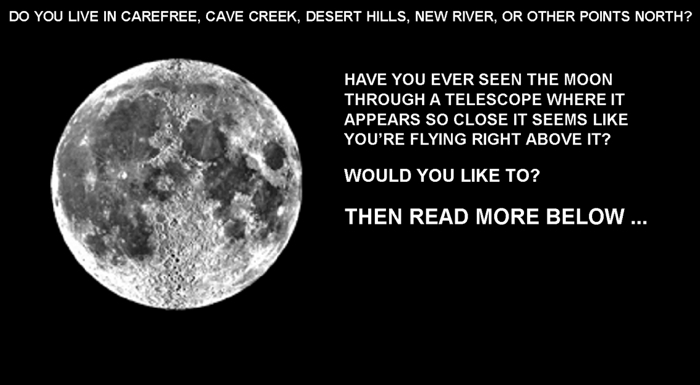 I am pleased to announce here, to my readers, the creation of the Desert Foothills Astronomy Club (DFAC). Intended as an educational resource for the North Valley, we will hold our meetings at Boulder Creek High School (BCHS) in Anthem. Dates are yet to be determined, as this notice signals the start of our charter membership drive. You can learn more about DFAC at our official website: www.dfacaz.org. The website is still “under construction,” but has more detailed information about proposed club activities and structure, including a map to our BCHS meeting place. Kevin Imes, Principal of BCHS, is excited about hosting DFAC. Mr. Imes taught science for 14 years, and would like to see a student astronomy club working in collaboration with DFAC. If you are interested in becoming a charter member of DFAC, contact information is available on our website. Epilogue: [added July 31, 2011] DFAC is still active as of this writing, continues to add new members, and will likely be a permanent resource for the North Valley. We have members from as far east as Peoria, and as far south as Tramonto. Our website has expanded significantly. We now meet at the North Valley Regional Library in Anthem, AZ. Check out our website to learn more about the entertaining and educational activities enjoyed by our members.